This page lists my publications (both peer-reviewed and invited). As you can see, I have not really focused a lot of my professional energy in this direction lately. I plan to make a concerted effort to reinvigorate my research activity over the coming year. This will include both microbiology and assessment scholarship. Let's see how that turns out. Pandak, W.M., P. Bohdan, C. Franklund, D.H. Mallonee, G. Eggertsen, I. Björkhem, Z.R. Vlahcevic, and P.B. Hylemon. Expression of Sterol 12-Hydroxylase Alters Bile Acid Pool Composition in Primary Rat Hepatocytes and In Vivo. Gastroenterology 120:1801-1809 (2001). Dean, C.D., C.V. Franklund, J.D. Retief, M.J. Coyne, Jr., K. Hatano, D.J. Evans, G.B. Pier, and J.B. Goldberg. Characterization of the O Antigen Locus from the Serogroup O11 Pseudomonas aeruginosa Strain PA103: Identification of the O Antigen Polymerase Gene. J. Bacteriol. 181: 4275-4284 (1999). Franklund, C.V., and J.B. Goldberg. 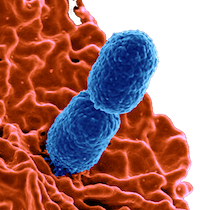 Cloning and Characterization of gltX from Pseudomonas aeruginosa PAK. J. Bacteriol. 181:3582-3586 (1999). Franklund, C.V. and R.J. Kadner. Multiple Transcribed Elements Control Expression of the Escherichia coli btuB Gene. J. Bacteriol. 179:4039-4042 (1997). Aitchison, Paul M., Spencer B. Gay, C.V. Franklund, and J.J. Jackson. A Web-based End of Rotation Quiz. Acad. Radiol. 4: 860-61 (1997). Franklund, C.V., S.F. Baron, and P.B. Hylemon. Characterization of the baiH Gene Encoding a Bile Acid-Inducible NADH:Flavin Oxidoreductase from Eubacterium sp. Strain VPI 12708. J. Bacteriol. 175:3002-3012 (1993). Baron, S.F., C.V. Franklund, and P.B. Hylemon. Cloning, Sequencing, and Expression of the Gene Coding for Bile Acid 7-Hydroxysteroid Dehydrogenase from Eubacterium sp. Strain VPI 12708. J. Bacteriol. 173:4558-4569 (1991). Hylemon, P.B., P.D. Melone, C.V. Franklund, E. Lund, and I. Björkhem. Mechanism of Intestinal 7-dehydroxylation of Cholic Acid: Evidence that Allo-Deoxycholic Acid is an Inducible Side-Product. J. Lipid Res. 32: 89-96 (1991). Franklund, C.V., P. de Prada, and P.B. Hylemon. Purification and Characterization of a Microbial, NADP-Dependent Bile Acid 7-Hydroxysteroid Dehydrogenase. J. Biol. Chem. 265: 9842-9849 (1990). White, W.B., C.V. Franklund, J.P. Coleman, and P.B. Hylemon. Evidence for a Multigene Family Involved in Bile Acid 7-Dehydroxylation in Eubacterium sp. Strain VPI 12708. J. Bacteriol. 170: 4555-4561 (1988). Franklund, C.V. Microbiology. Chancellors Learning Systems, Fishers, IN. (2004). Lathrop, J.T., C.V. Franklund and R.J. Kadner. Communication Between Membranes in TonB-Dependent Transport Across the Bacterial Outer Membrane. In W.N. Kohings, H.R. Kaback and J.S. Lolkema (eds). Handbook of Biol. Phys. Vol. 2. Elsevier Press (1996).